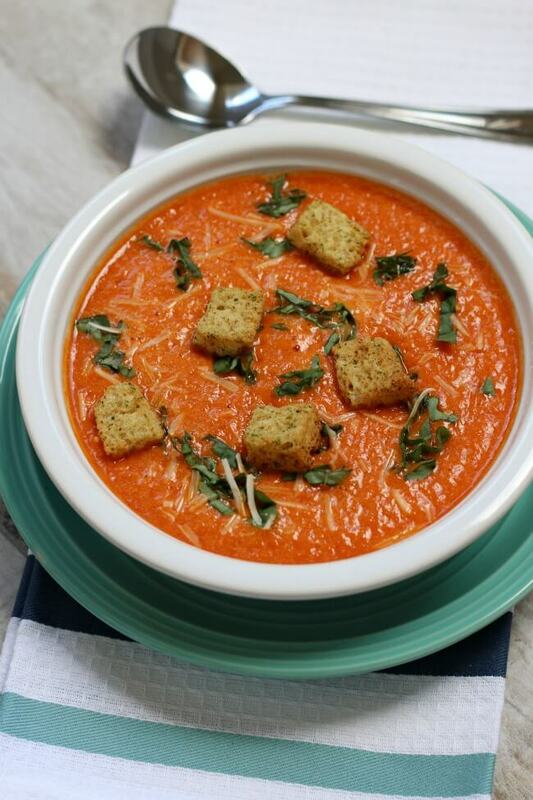 This Blender Roasted Red Pepper Soup is my favorite soup to make on a whim. It’s perfectly seasoned and the flavor is powerful, but not over the top. I’ve made it so many times in the past 2 months because I simply cannot get enough of it! Today I want to share this soup recipe with you because it has been on my mind and in my tum a lot lately. I think that it is waaaaay better than any cafe’s red pepper soup and it can be whipped up in your own kitchen in no time. 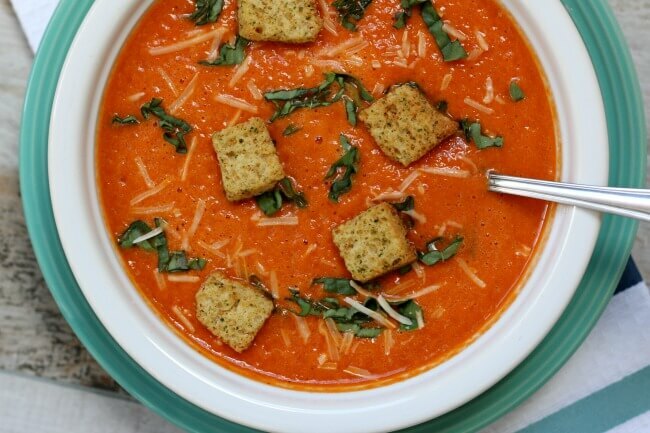 This soup is perfectly creamy and comforting. Every single time I make it I can’t believe how awesome it tastes. Personally for me, this is my perfect type of food (along with chewy and chocolatey brownies and cookies and avocados, oh and peanut butter). Oh, and per serving it’s only 122 calories (I can’t guarantee that you’ll only eat one serving). Preheat your oven to 425° F. Line a cookie sheet with foil (I like to use non-stick foil...dull side up). Wash your red bell peppers, core and seed them, and slice them into 1/2 inch strips. Place them on the foil-lined cookie sheet. Place in the oven on the top rack. Cook for 30 minutes. Remove from the oven and place peppers in the blender. Place tomatoes, broth, half and half, salt, pepper, garlic, basil and red pepper flakes in the blender. If using a Blendtec, push the soup button and let it run it’s cycle and then serve and enjoy. If using another blender, blend the soup until smooth and then heat on the stove. 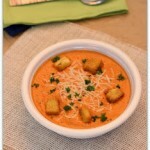 Serve the soup topped with croutons and parmesan cheese, if desired. This soup is delicious. I usually make it with low fat milk and it is still comfort food. I love this recipe so much!